If you had a hunch eating bacon, sausage and hot dogs wasn't good for you, there's research to back you up. Processed meats can increase the risk of heart disease by 42 percent and diabetes by 19 percent, U.S. researchers said Monday in the latest study on dietary health risks. However, unprocessed lamb, pork or beef did not increase those health risks, according to a Reuters report, suggesting that increased salt and chemical preservatives of processed foods may be the real culprits. The study, which was an analysis of other research, didn't look into meat's role in developing high blood pressure or cancer. "To lower risk of heart attacks and diabetes, people should consider which types of meats they are eating," said Renata Micha of the Harvard School of Public Health, who authored the study. "Processed meats such as bacon, salami, sausages, hot dogs and processed deli meats may be the most important to avoid," Micha said in a statement. The study, which appeared in the journal Circulation, was questioned by the American Meat Institute. "At best, this hypothesis merits further study. It is certainly no reason for dietary changes," James Hodges, the organization's president, said in a statement. Micha and her colleagues reviewed around 1,600 separate studies to investigate the differences in health risks between processed and unprocessed red meat. Processed foods were any that were smoked, cured, salted or had chemical preservatives added, including bacon, salami, hot dogs, sausages or processed deli meats. 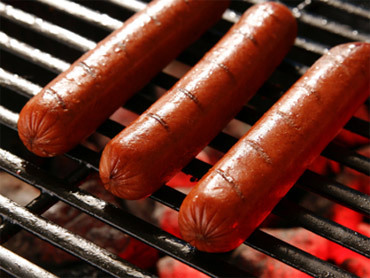 The evidence suggested that on average, each 1.8 oz serving of processed meat - the equivalent of one hot dog - was linked to higher risks of heart disease and diabetes.